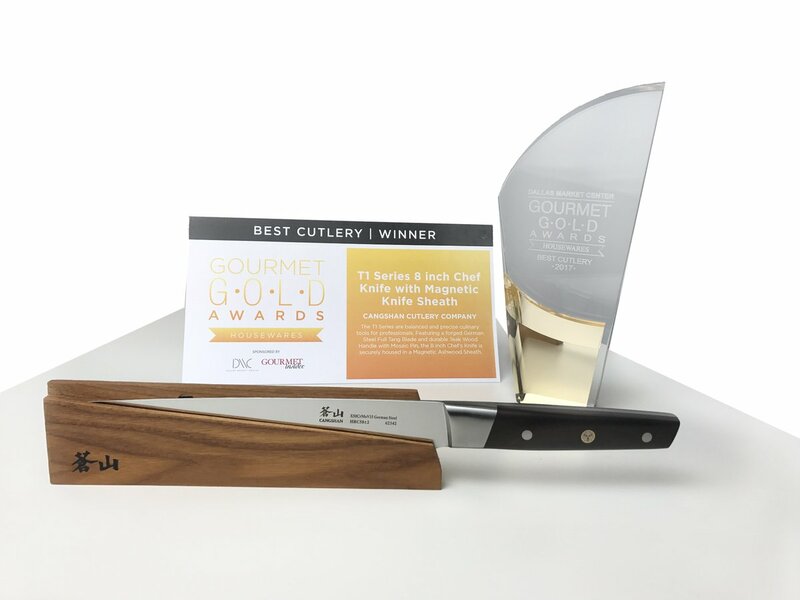 We are exceptionally happy, humbled and proud to be chosen to receive the Best Cutlery Dallas Gourmet Gold Housewares Award for our new knife design, the Cangshan R Series with Magnetic Wooden Sheath. The R Series is both bold and straightforward, featuring a sleek and functional silhouette it becomes elegant in its simplicity. Darkly textured wood tones adeptly accentuate the bright, brassy notes of the unique mosaic rivet elevating the aesthetics of the balanced and professional caliber knife. Each knife comes with a gorgeously grained carbonized Ashwood sheath featuring a beautiful copper toned magnet that lends a striking accent while also safely securing the knife blade during storage.